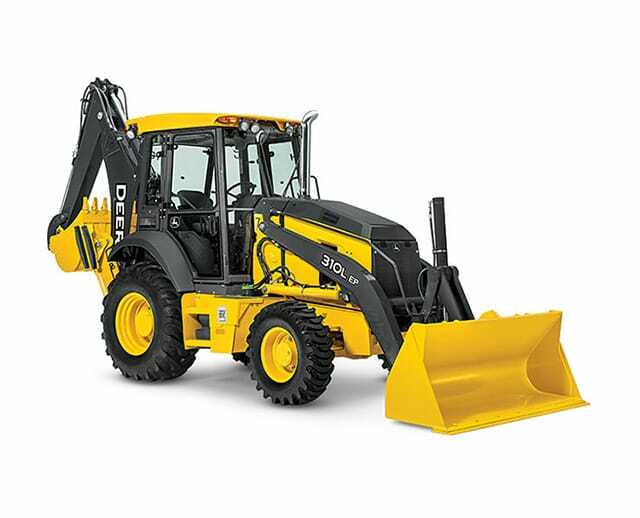 A popular choice among contractors, the backhoe loader is a versatile piece of construction equipment. You can use it to excavate and dig in all types of terrain. With this guide, you will learn more about backhoe loaders, including the history behind the machines as well as the various manufacturers and models. As for operating the machinery, you can learn what type of construction jobs benefit from the backhoe loader, how to operate it safely, and where a worker can receive specific training on becoming a backhoe loader operator. Backhoes perform impressive digging functionality on even the most rugged of jobsites. Also known as a backhoe or loader backhoe, the backhoe loader features a backhoe mounted on the back of a tractor-like vehicle. It also has a digging bucket or shovel attached to its articulating arm. Since the backhoe digs by moving earth backward, the term “backhoe” comes from the action of the shovel. Some machines have a front- or rear-mounted coupler that allows for attachment use. Tractor: This is the vehicle part of the backhoe loader. Its rugged tires and powerful turbocharged diesel engine help the machine navigate rough terrain. The cab, which is either completely enclosed or has an open canopy structure, sits higher than other earth-moving equipment and features basic steering controls. Loader: Attached to the front of the machine, the large shovel scoops, lifts, moves, and smooths dirt. You don't usually dig with this piece of equipment; instead, you pick up and carry loose material. You can also smooth areas over or push dirt like a plow. You control the loader while operating the tractor. Backhoe: The most important piece of the machine, the backhoe sits at the back of the machine and acts like an arm. It digs, lifts, and drops dirt, including compact earth. This part can easily get into tight spaces and works best at digging ditches. You also control the backhoe while operating the tractor. There are three components to the backhoe, and they all operate similarly to a human arm with a wrist, elbow, and shoulder. On the machine, it's the boom, stick, and bucket. Lighter and faster than the skid steer, the backhoe loader works best for excavation and digging projects. You can use one to dig a trench with the backhoe and back-fill it with the loader. Use the loader to remove dirt out of an area, and then use the backhoe to fill the space with dirt once you place power lines or pipes into position. You can also use this machine for landscaping projects in which you dig holes for ponds or plants and prep the dirt for planting. There are three different sizes of backhoe loaders that you can use for certain tasks. They include the mini, standard, and large, all of which you can rent from BigRentz. The first backhoe loader got its start in 1945, thanks to Joseph Cyril Bamford. He started his own business, called JCB, in a rented garage in England. He created two-wheel trailers, which were followed by four-wheel trailers. He added hydraulics to create the first four-wheel steel tipping trailer. In 1949, Bamford created the major loader, which was a front loader that attached to a Fordson Major tractor. A few years later, he developed the world's first backhoe loader by adding a backhoe onto the back of a major loader. The end of World War II had some impact on the development of backhoe loaders. Due to the housing need for soldiers returning from World War II, the construction industry saw a need for more efficient construction equipment. Between 1945 and 1955, contractors needed compact machines that could work quickly and complete several tasks. The demand for equipment and activity in the housing market was high. Many contractors tried different methods to get their equipment to work more efficiently. Unfortunately, many tractors did not accommodate attachments to the front or back. In the spring of 1957, American company Case Construction Equipment introduced the first factory-integrated backhoe loader. The machine tackled the loading, digging, and carrying requirements needed in the construction and agricultural industries. The Case Model 320 offered contractors versatility at the job site, as they could quickly complete small jobs and move materials. Shortly after that, Case introduced the Case Model 402, which was the industry's first diesel-powered backhoe loader. It wasn't until 1967 that an extendable backhoe was introduced. There are companies in the United States and Europe that manufacture backhoe loaders. The following are some of the more well-known companies that produce high-quality backhoe loaders, some of which are available at BigRentz. Founded in 1842 in Racine, Wisconsin, CASE Construction Equipment manufactures construction machinery. 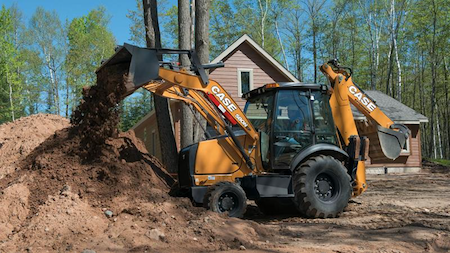 As the first company to introduce a factory-integrated backhoe loader, CASE manufactured its 500,000th loader in 2005. In 2017, the company released a T-Series backhoe loader in Europe. This series features high-lifting capacity, fast roading speeds, and quiet cabs. The N Series backhoe loaders offer an advanced drivetrain, electric system, and hydraulics. Factory options on this model include LED lights and bolt-on front fenders. In 2017, its CASE 580N Series earned the Highest Retained Value Award from EquipmentWatch for the second straight year. Officially formed in 1925, Caterpillar Inc. designs, markets, and sells engines and machinery. The Caterpillar name was reportedly inspired by a steam tractor that had planks around the wheels and crawled like a caterpillar. This invention eliminated the need for a temporary plank road. Today, the company is the world's leading construction machinery manufacturer. Marketed under the Cat brand name, the company manufactures a variety of backhoe loaders, including its F2 series. This model, which includes the 415F2, 420F2, and 450F, uses load-sensing and piston pumps to match the hydraulic flow to work demands. The Cat backhoe loader model 450F is its largest option and can dig 17.2 feet deep. Established in 1945, JCB came about from the initials of the founder: Joseph Cyril Bamford. It was the first manufacturer of backhoe loaders, starting in 1953. A year later, it released the JCB MK1 Excavator, which consisted of a backhoe and loader attached to a UH2711 Fordson Power Major tractor. In 1963, the JCB 3C took backhoe loader performance to a higher level, thanks to a redesign. Today, the company is one of the leading manufacturers of construction equipment and the world's leading backhoe producer. JCB manufactures almost half of all backhoe loaders, with 22 plants on four continents and a sales presence in 150 countries. 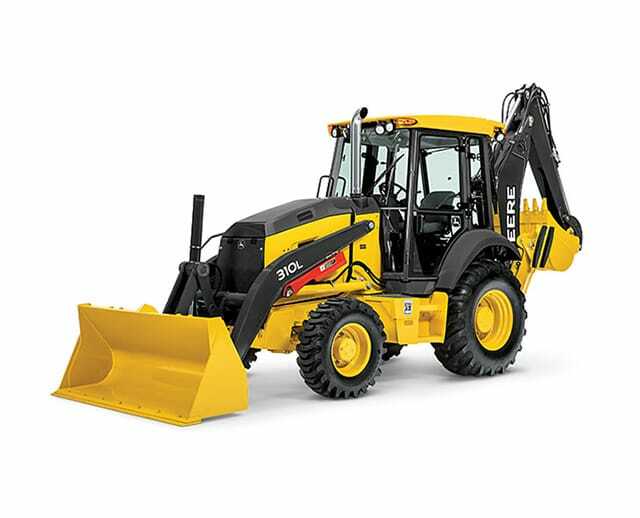 Its 3CX 15 Super Backhoe is its most popular loader and features innovative technology, a powerful 109-horsepower engine, and a maximum bucket breakout force of 13,603 lb.-ft. Founded in 1837 by John Deere, the company began selling self-scouring steel plows. Several years later, the company produced 100 of the plows each year and eventually moved its headquarters to Moline, Illinois, to take advantage of cheaper transportation costs. Over the years, the company expanded its offerings, adding other tools to complement the steel plow. Currently, John Deere produces seven different types of backhoe loaders, including the 310SL HL, 410L, and 710 L. All these three have an enhanced craning lift capacity, a smooth shifting capability, and a new spring-type rear coupler. The 710L, which is the largest type available, can dig 17 feet 3 inches with a bucket tearout force of 18,959 lb.-ft. Created in 1921, Komatsu Ltd. was originally part of the Takeuchi Mining Company and known as Komatsu Iron Works. It separated from the mining company and took on the name Komatsu Ltd. Headquartered in Japan, the company manufactures and sells construction and mining equipment as well as industrial machinery. Komatsu is the second-largest manufacturer of construction and mining equipment in the world, second only to Caterpillar. Its products have stellar horsepower and state-of-the-art technological advances. The company offers several different models of backhoe loaders, including the WB93S-5 and WB97S-5. Established in 1895 as the New Holland Machine Company, New Holland produces a line of agricultural products. These machines include tractors, balers, harvesters, and loaders. With its administrative headquarters in Italy, the company has its brand headquarters in New Holland, Pennsylvania. Its backhoe loaders have an optional Auto Glide Ride control, which was previously reserved for only wheel loaders. This feature makes operation easier and helps to reduce spillage even while operating at high speeds. 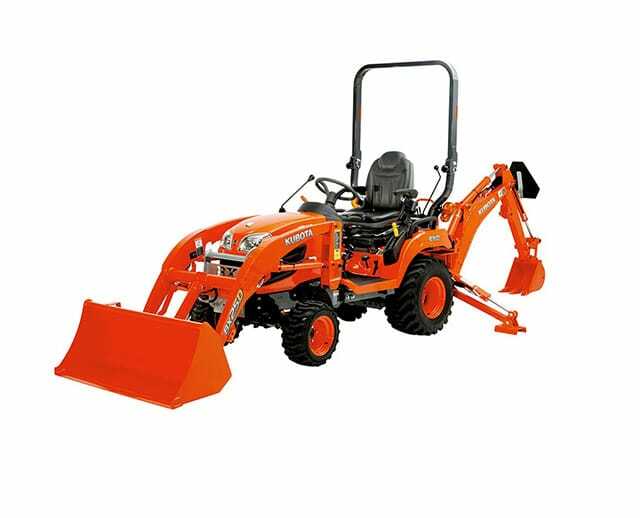 Its smallest model, which is the B95C, operates at 97hp and has a maximum digging depth of 14 feet 6 inches. The largest one offered by New Holland is the B110C, which has 110hp and a digging depth of 15 feet 6 inches. Backhoes can be utilized for a multitude of tasks, including landscaping, agriculture, and construction. The backhoe loader is a vital piece of construction, landscaping, and agriculture equipment. Because of its versatility, the backhoe loader can be used in various environments and for a range of jobs. Compact and mid-sized backhoe loaders work well for smaller spaces since they have smaller buckets, while larger loaders can reach greater depths and carry heavier loads. The backhoe loader's multi-functional ability makes it an important workhorse on any construction site. Use backhoe loaders for excavation and earthmoving projects, such as grading a road or digging a trench. They work well in transporting material and breaking asphalt. When smoothing earth, use the bottom part of the loader to create a smooth surface, or place a plow on the opposite end of the bucket. In landscaping, backhoe loaders can dig holes for ponds and other landscaping features, as well as preparing dirt for planting trees, shrubs, and flowers. Use the backhoe part of the machine to uproot trees. For agriculture, the backhoe loader can do many of the tasks that a tractor can do, and then some. You can transport heavy items, dig ditches, and form holes for anchor fence posts. Because you can add hydraulic power attachments to backhoe loaders, you can use this machine to do other tasks. The quick coupler mounting systems enable you to easily fit a number of tools and attachments to the machine. The specific applications for backhoe loaders depend upon the type of attachment. One of the most common attachments for contractors is the hammer or breaker. You can use this attachment to break concrete, asphalt, or rocky soils. Utility contractors can use the tiger tooth attachment for areas with harder soil or break through frost in the northern climates. You can also add street sweepers, hydraulic hammers, augers, and tiltrotators. Some backhoe loaders feature buckets with a retractable bottom, enabling you to empty a load faster. This feature is best for grading and scraping projects. Raising the bucket too high: If you're on an unstable ground, don't raise the bucket too high or the machine might tip. Overturning the machine: Be extra cautious when operating the vehicle on a steep slope. Falling from the cab: Whenever you're operating the machinery, make sure you fasten your seatbelt. If the steps are wet due to rain or condensation, be careful entering and exiting the cab. Hitting an object: ditch, or person. Remain cautious when operating the machinery, especially when dealing with rough terrain. Load falling on a person: Make sure the area is clear of people before using the backhoe. Construction is a high hazard industry. 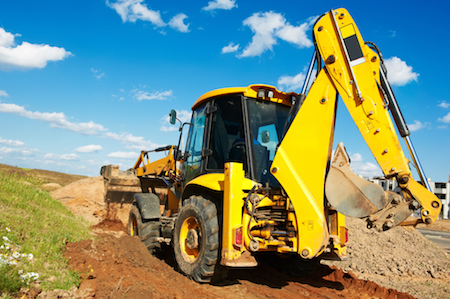 You must know how to properly operate a backhoe loader and follow safety protocols. The Occupational Safety and Health Administration (OSHA) sets out specific guidelines for safely operating a backhoe loader. 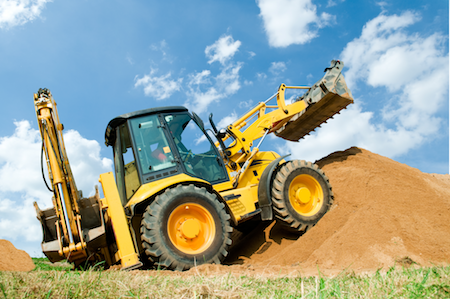 Follow these key protocols when you operate a backhoe loader. Travel at low speeds: You should drive around 5 miles per hour on the job site. There are usually people walking around the area, so it's best to take it slow. If the area has mud, loose gravel, or other rough terrains, you should remain cautious of braking conditions. Soft soil conditions occur around deep holes, so be wary around those areas. Carry a load low: Raising the bucket high reduces your visibility and lowers the machine's center of gravity. Keeping the bucket low while traveling reduces the risk of tipping and spilling the load, especially if you encounter rocky or hilly terrain. Raise the load when you arrive at the spot where you're going to set it. Keep the vehicle stable: Sometimes loads can change the machine's center of gravity and affect its stability. If you begin to lose control of the vehicle, stop everything until you regain control. Remain aware of workers and obstacles: Before you even operate the machine, make sure the backup alarm is working. When you move the machine, pay attention to your surroundings. Know the load charts: You need to know the proper load capacity for lifting materials. Check the spec sheet on the backhoe loader before you lift. This will inform you what the machine is capable of lifting, including the distance and height. You could also perform a test lift to make sure the machine remains stable. Use stabilizers when digging: Stabilizers keep the machine from tipping and sliding. Spread the stabilizers to their full width and have the loader bucket in solid contact with the ground. You don't want the tires to carry the weight of the machine. If that happens, the machine bounces and transmits the vibration to the cab. In case the ground is too soft, use blocks or cribbing to have the stabilizers get a solid footing. Never use a bucket to lift or carry people The purpose of the bucket is not for people to stand in. It is extremely dangerous for anyone to be inside the bucket, so make sure people have another way of transportation. Before a worker operates a backhoe loader, OSHA requires that he or she have training to operate these machines safely and properly. Workers also must comply with OSHA's excavation and trenching standards. Training is the responsibility of the employer and must comply with OSHA standards. The employer must make sure that all workers on the job site have training when working and moving around these heavy machines. In most situations, a worker gains experience as a backhoe loader by working on job sites as a laborer or truck driver. Experienced workers can help co-workers learn how to operate the machinery. You can start by doing manual labor and working your way up to operating the equipment. In addition to on-the-site job training, workers can participate in construction training programs. Since certification and licensing are not required to operate backhoe loaders, these training programs are optional. But if you opt to take these programs, it may give you an advantage when looking for a job. As a construction safety training firm based in Sacramento, Safety Academy for Construction Seminars specializes in safety training. Its three-day backhoe training program covers pre-shift inspection, startup, and overall operation. Hard Hat Training offers training throughout Canada and the United States. It provides OSHA-compliant training kits and online training courses, including a three-year backhoe loader training certification. Operators Training School is another option, and it offers a four-week, 160-hour course where people learn about trenching, grading, and excavation. Also, some equipment manufacturers, such as Caterpillar, offer training. 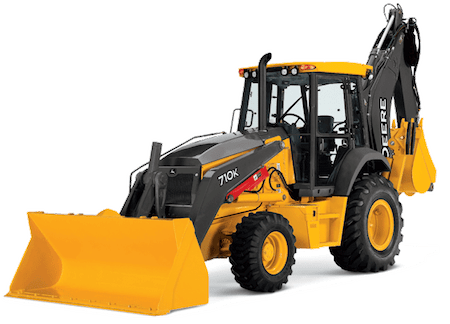 What sizes of backhoe loaders can I rent? BigRentz offers three sizes of backhoes available to rent. The terramite mini backhoe has a 6- to 8-foot digging depth. The standard John Deere 310/Case 580 backhoe operates around 60 to 90 horsepower and reaches depths between 12 and 14 feet. The large John Deere 410/Case 590 backhoe runs 91 to 105 horsepower and reaches depths around 14-15 feet. Enter your city or ZIP code to get an accurate list of backhoe loaders available. Once you find the best fit for your project, click “Book Online” and enter your information. How long can I rent a backhoe loader? When you rent your backhoe loader from BigRentz, you receive flexibility for the rental timeframe. You can choose from one-day, one-week, and one-month rental periods. If you need an extension on your rental, simply call BigRentz at least four hours before the rental period ends and ask for an extension. Do you deliver and pick up equipment? Yes, BigRentz delivers and collects equipment. For safety and insurance purposes, customers cannot pick up or return the equipment themselves. BigRentz does its best to pick up equipment at the end of each rental term, but sometimes scheduling issues or other issues arise. If that occurs, you're responsible for housing the equipment until it is picked up. If you cannot, contact your rental expert in advance to work out a solution. The equipment arrives at your site completely fueled. However, you are responsible if the equipment needs additional fuel. If you fail to do so, you will be charged a refueling fee. Backhoe loaders are one of the most versatile pieces of equipment you can rent. As an excellent multipurpose machine, a backhoe loader can tackle a variety of jobs in construction, agriculture, and landscaping. Whether you need to dig a trench, smooth out the earth, or move materials, a backhoe loader can help you with that task. Renting equipment such as a backhoe loader is more cost-effective when compared to buying one, especially if you don't have space to store the machinery or the money to purchase this expensive piece of equipment. At BigRentz, you can find the best selection of backhoe loaders to rent at the best rates. The flexible rental periods let you complete your job in time at an affordable price. To learn more about backhoe loader rentals, visit BigRentz.